A historical overview of car registrations, including an explanation of formats. When it became obvious that the motor car was here to stay, and that its popularity was rapidly growing, the British government took various steps to introduce regulation and control. It also recognised the need to be able to identify and trace vehicles in the event of accidents, their being used in the execution of crime or their being stolen. One effect of the 1903 Motor Car Act (which actually took effect at the beginning of 1904) was to require all vehicles on British roads to be registered and to display registration plates, which would enable them to be easily identified. So, although the first car registrations were actually issued in 1903, the legal requirement for vehicles to display them didn't take effect until 1904. Several numbering systems have been implemented since 1903, the first of which operated until 1932. Things got off to a fairly uncertain start in 1903, with various inconsistencies and changes to the original car registrations numbering system appearing in some regions. However, it is generally true to say that the very early number plates consisted of a letter code denoting the issuing authority, and a sequential identification number. Unlike more recent versions, this first generation of number plates had no year identifier. This original car registrations series included the combinations A1-YY9999. 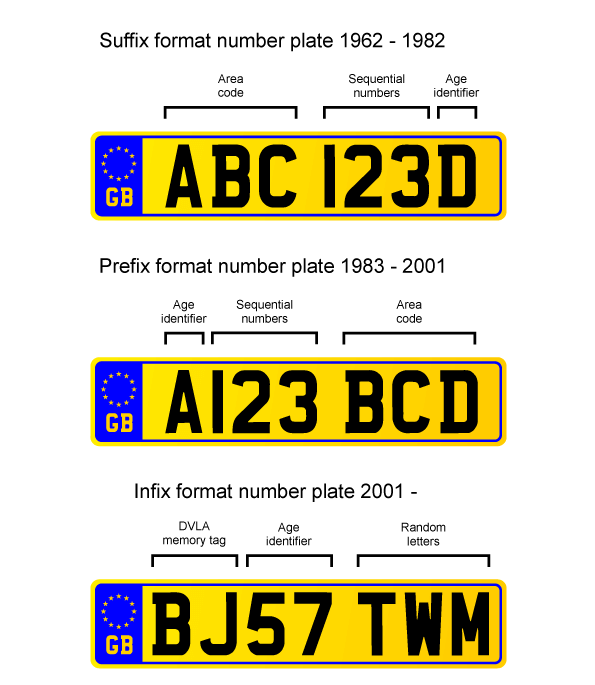 The letter component (either single character or a pair) identified the local authority in whose area the vehicle was registered (A, for example, indicated a vehicle registered in London). The number component simply incremented and provided the unique identification for the bearer vehicle within the area shown by its letter code. In England and Wales the area letter codes were assigned alphabetically according to the size of the population in each authority's area, hence crowded London's allocation of the 'A' designation. In Scotland and Ireland the system worked a little differently. Registration in those regions began with the letter S in Scotland and I in Ireland. These national identifiers would be followed by another letter which, like the English and Welsh versions, specified the local registering authority, and then by the sequential ID number. Upon reaching 9999 and thus exhausting its available numbers, an authority would be given another two-letter mark which would enable them to continue issuing car registrations. These new letter codes, however, followed no predictable sequence or pattern, as they were allocated ad hoc to authorities that requested them. In 1932 the scheme was extended due to the shrinking number of available combinations. The extension consisted of three-letter/three-number combinations in the range AAA1 to YYY999. Further extensions to the scheme were required in some areas by the 1950s, again due to demand depleting the pool of remaining numbers. In these areas, the format was reversed so that the number component preceded the letter component. In the areas of greatest demand, yet another extension was introduced within a decade, this time using the range 1A -9999YY. Demand for registrations continued to grow as the number of vehicles on UK roads increased, and a slightly more flexible format was devised, one which would provide more information about the vehicle. This new format retained the principle of the regional identification letters, and the sequential ID number. The innovation was the addition of a letter code at the end of the plate, which indicated the year of issue. To illustrate: in the first year of this new system, numbers were drawn from the range AAA1A-YYY999A (the 'A' signifying 1963, which was the year in which this format commenced). Similarly, in the following year of 1964, the range of possible registrations issued was AAA1B-YYY999B, which is the same as the range for the previous year but with the appropriately altered year suffix, and so on year after year. This had two major benefits: it enabled people (including prospective purchasers of used cars) to determine the age of a vehicle, and it meant that the number sequence used to identify individual vehicles could be reused each year, as the year letter would change. Because of the placing of the year code at the end of the character string, these new plates became known as suffix number plates. Below is a table showing the issue dates for car registrations bearing each of the suffix year codes. By 1982 the suffix series had run its course, and in 1983 another reversal of format took place. The new system used the range A1AAA-Y999YYY with the year indicator now coming at the beginning of the string of characters, followed by the unique ID number and the letter group containing the region code. Unsurprisingly, as the year letter came at the start, this became known as the prefix number plate format. The benefits of the prefix system were the same as those that applied to the suffix system. Below is a table showing the issue dates for each of the suffix year codes. Inevitably, the combinations available with the prefix system also began to run out eventually, and yet another number plate format was required. In September 2001 the current style of UK vehicle registration plates was introduced. The current number plate format consists of a two-letter regional identifier called the local memory tag, a two-digit year code or 'age identifier' and finally a three-letter random element which provides the specific identification for each vehicle. An example of this current format is the registration BD51 SMR. BD is a code for Birmingham, 51 is the code for September 2001. SMR is a random letter combination which will be assigned to only one registration issued in any one area during any one age identifier period, thus uniquely identifying the vehicle to which it is applied. Another important change is that registrations now change twice a year instead of once. The use of a two-digit code instead of a single letter allows for many more permutations, thus extending the useful life of the current scheme. Below is a table showing the issue dates, and projected issue dates, for each of the current year codes. History shows that demand has often grown at a rate not foreseen by those who devised these registration-numbering systems. While the current system should remain operable until 2049, only time will tell if, in reality, it offers sufficient permutations to satisfy demand for new car registrations.